The following are excerpts from comments by R. S. Davidson, Ann Rudolph, both of Battelle Laboratories, Columbus, Ohio and Dr. Emanuel Rudolph, Botany Department, The Ohio State University. faculty of The Ohio State University for 45 years (1919-1964) prior to his retirement in 1964.
undergraduate studies were undertaken at both the University of Michigan and the University of Kentucky. Graduate work at The Ohio State University culminated in the Ph.D. degree in 1918. During his graduate years he participated in the early efforts to control wheat stem rust through the USDA barberry eradication program. His graduate research was devoted to some of the earliest studies of agriculture crop ecology, resulting in his publications Crop Centers of the U. S. and The Relation of Plant Succession to Crop Production. These investigations established some of the present day agricultural crop production principals. meritorious. At about this same time he was also involved in a flood control program in the Miami River Valley (Ohio) utilizing native grasses on the river banks and flood plain. In the early 1920s he participated in studies of the impact of air pollution from copper smelters on arid land crop production in the Salt Lake Basin. Botany, Genetics and the History of Science. He served as treasurer of the Ohio Academy of Science for almost two decades and was named an honorary life member of the Academy in 1966. 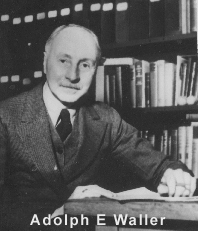 From 1919 to 1923 he was on the editorial board of Ecology. He was a member and active participant in many professional societies. Both the American Academy for the Advancement of Science and the Ohio Academy of Science named him as Fellow. He was a member in the Ohio Academy of Medical History, The Ecological Society of America, the History of Science Society and Sigma XI. research. He was in outstanding field botanist and his field trips to Fairfield and Hocking counties were highlights for his students. In 1940 he located the previously unreported Iris christata in both Adams and Scioto counties. He published, authored and co-authored numerous publications including A Guide to Ohio Plants and an extensive series of papers dealing with the early Ohio botanists and geologists who also held medical degrees. Following his retirement he served as a consultant to the Columbus Laboratories of Battelle Memorial Institute for several years. View a list of past Waller Memorial Lecture speakers [pdf]. [pdf] - Some links on this page are to Adobe .pdf files requiring the use of Adobe Reader. If you need these files in a more accessible format, please contact mginfo@osu.edu.